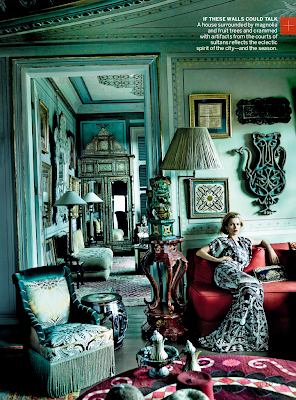 Supermodel Kate Moss teams up with British born Nigerian actor Chiwetele Jiofor and photographer Mario Testino for a visual tour de force set in the majestic environs of Istanbul for American Vogue's December 2013 issue. Moss and Jiofor are lensed by Testino as they play star-crossed lovers while cruising along the spectacular Bosphorus and taking in the local sights. Fashion Editor Tonne Goodman weaves a spell of seduction with Jiofor looking every bit the leading man in form fitting tailored suits and Moss his stunning date in elegant resort looks for both day and night. Testino captures the teeming energy of Istanbul's street life from the Egyptian bazaar to the head-spinning Mevlevi dervishes, and also allows for quieter moments of reflection surrounded by the grand opulence of Istanbul's sacred mosques and palaces. Moss who celebrates her 40th Birthday early next year, looks to be in the prime of her life imbuing the images with a timeless beauty and star quality. IMA has a long-standing love of American Vogue having amassed a collection dating back to the mid-eighties, and Testino's latest editorial instalment harks back to those magical days when American Vogue's visual storytellers Arthur Elgort, Patrick Demarchelier, Helmut Newton, and Peter Lindbergh reigned supreme.